We were deliberating about our next tour. On our probables-list were a lot of places from Rajasthan to ... Singapore. One fine day my husband came up with the suggestion 'How about Australia - New Zealand?' On browsing over the tours, we realized it was almost as far as making a trip to the US - time/distance-wise. Australia is a continent alright, New Zealand has been our younger son's favorite place since childhood, not many friends and relatives have been there .... Ok, so be it! Some well-meaning friends recommended New Zealand alone for the same number of days. But we wanted to do both the countries - having gone that far. And there is no likelihood of another tour in the same direction! We just wanted a taste of both countries. We booked our tickets for the group tour with Veena World for 13 days beginning on 24 May. Winter would have set in by then; also New Zealand would be colder than Australia. We equipped ourselves with warm clothes and packed our bags. Our family was more excited than us. We were a group of 15 plus Tour Manager - quite a compact crowd - mostly senior citizens (we were the senior-most). 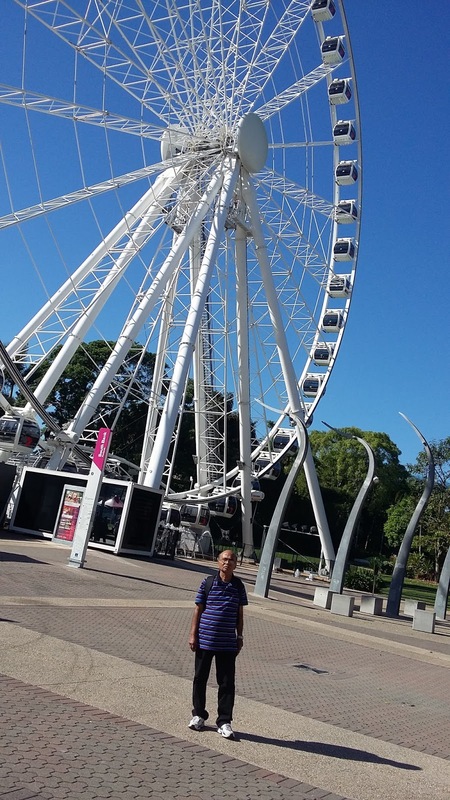 We had to start from home in Pune at the unearthly hour of 1.30 am and drive to Mumbai, take the flight from there to Brisbane with a stopover at Singapore. We met our Tour Manager Mr.Harshal Pansare and the other members of our group, collected our goody bags from Veena World representative and went through the usual rigmarole of international air travel and boarded our Jet Airways flight to Singapore at 9.30 am. We had lost practically the entire previous night's sleep and we tried to doze a bit during our 51/2 hour flight to Singapore, keeping in mind we were gaining in time as we were travelling east and another night would be lost by the time we landed in Australia. 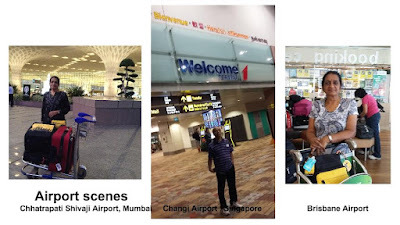 We freshened up at Singapore's Changi airport before boarding the Qantas flight to Brisbane after a stopover of 2 1/2 hours. 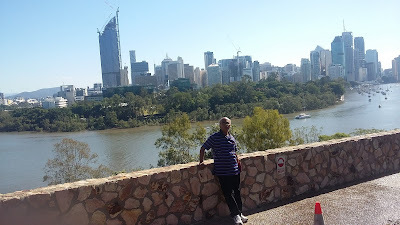 Another long flight of 7 1/2 hours which was dotted with food breaks, 'nap' breaks, 'stretch-n-walk' breaks and movie breaks, we landed at Brisbane, Queensland at 6.45 am - Australia is 4 hours ahead of India. 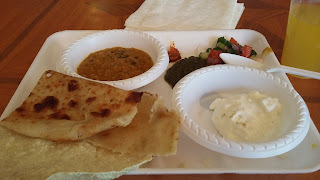 We had filled up our Customs declaration forms, ticking 'yes' to medicines (for self) and food (dry Indian snacks). As we waited at the Immigration counter after collecting our bags, we noticed sniffer dogs sniffing around to check for forbidden food items in the bags (even nuts are banned). I am sure some tourists' hearts must have missed a beat due to stuff / 'chutneys' tucked in their bags! Anyway everyone was cleared and we were through. Our tour was to start bang on! Check-in at hotels were always after 3 pm. So we freshened ourselves and even changed clothes and were fresh for the day in spite of disrupted sleep for two days and jet lag. The enthusiasm is always infectious in a group tour. Our luggage was loaded in the luggage van tagged to our coach and we took our seats in the coach. 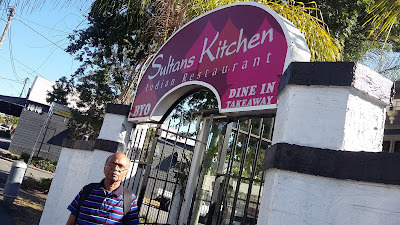 Our coach took us to Sultan's Kitchen - an Indian restaurant - with a good ambiance. 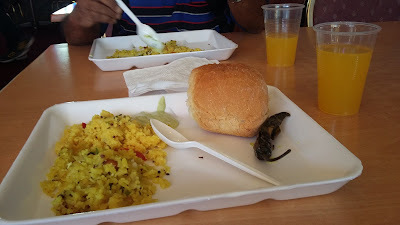 We relished our first (and as it eventually turned out - the only) breakfast in Australia of yummy 'poha' and 'vada pav' (sorry, the vada is facing the rear in the pic)! When we came out, we couldn't help admiring the nearby houses on hill tops. 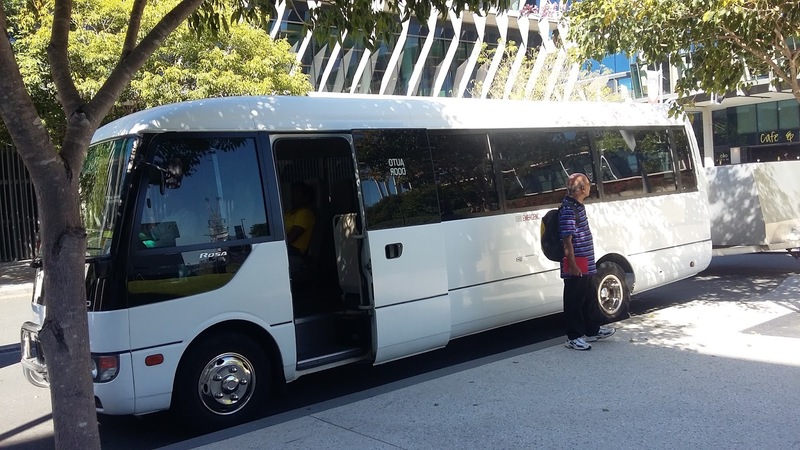 Energized, we boarded our coach for the City Orientation Tour. 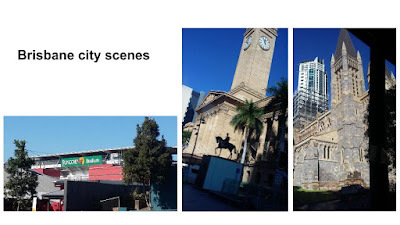 We passed by Suncorp Stadium, the Town Hall, and Brisbane Cathedral. 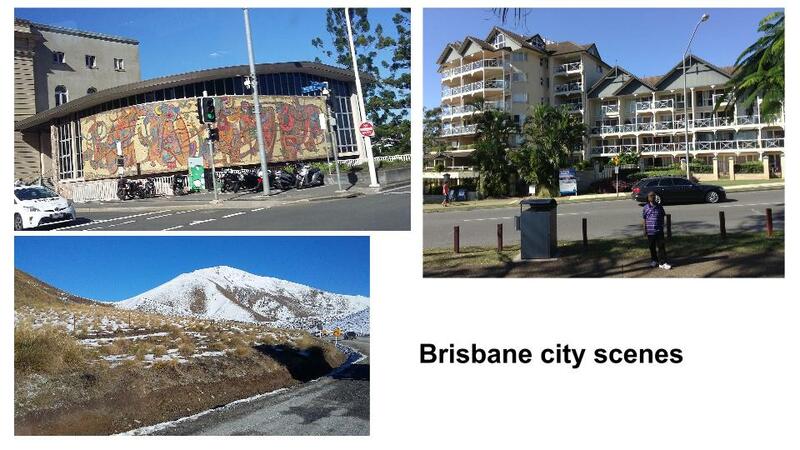 We got to see fresh snow splattered on mountains, as well as interesting buildings. 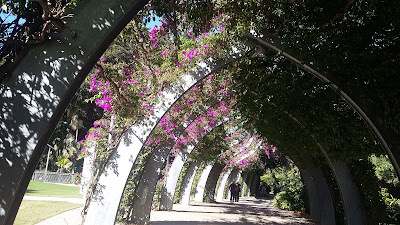 We got down at South Bank Waterfront and its park-lands which are one of Brisbane's most important cultural precincts regularly hosting large scale festivals and events. We enjoyed loitering around the serene and beautiful area with the backdrop of the Wheel of Brisbane and Brisbane river. After that we went to the nearby Kangaroo Point - no we didn't get to view kangaroos there. It's just called that - it is a popular recreation spot, located on a peninsula with the Brisbane River flowing around. 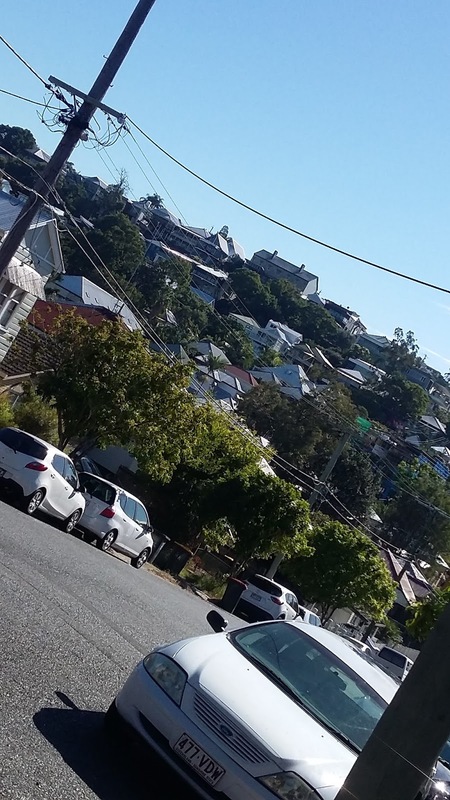 The landscape of Kangaroo Point is predominantly high rise apartments towards the tip of the peninsula while the other end is predominantly low-medium density apartments / houses. The jet-lagged group just lazed around feasting their eyes on the scenic beauty. Lunch time found us once again at Sultan's Kitchen - we enjoyed a good meal. As we were leaving, my husband told me that the couple running the restaurant hailed from Pune. As I went to the lady to thank her for the great food, I made small talk and realized she had lived in Pimpri. Pimpri for the teacher in me was synonymous with Jai Hind. And sure enough she was a student there - but that was before I had joined. The connection was enough to bond us - we exchanged a few more notes and clicked a photo together but as most of our group had boarded the coach, I had to bid a hasty goodbye. I couldn't help musing it is a small world. 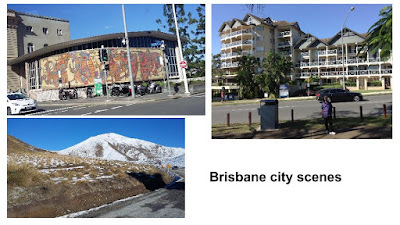 We started on our drive to Gold Coast. In a well articulated presentation, the author has definitely managed to keep the interest of the readers alive, all through the article. Finding a Pimpriwala in the land of Kangaroos is like "Finding a Needle in the Haystack".